May 18, 2018 Dan O.
September ’01. A simpler time. It’s Sept. 11, 2001 when Elliot (Joe Purdy) and Joni (Amber Rubarth) meet on a plane. After hearing of the devastation in New York City, the plane has to make a sudden drop-off, leaving the two sort of stranded and without any real mode of transportation to get where they have to get. That is until Joni decides to get her aunt’s van and drive cross-country to New York, in hopes of seeing her family and ensuring that all is well in this rough time. Same goes for Elliot, so the two take a trip together, where they meet all sorts of colorful characters, make memories, and sing a lot of folk music. American Folk was, at one point, titled to be Sept. 12, and thankfully, they changed that. For one, it’s a hokey-title that makes it sound like a message movie. Two, the movie itself isn’t really all that much about 9/11, as much as it’s used as a back-drop to this road trip and the characters themselves. And lastly, it’s just not a great title. 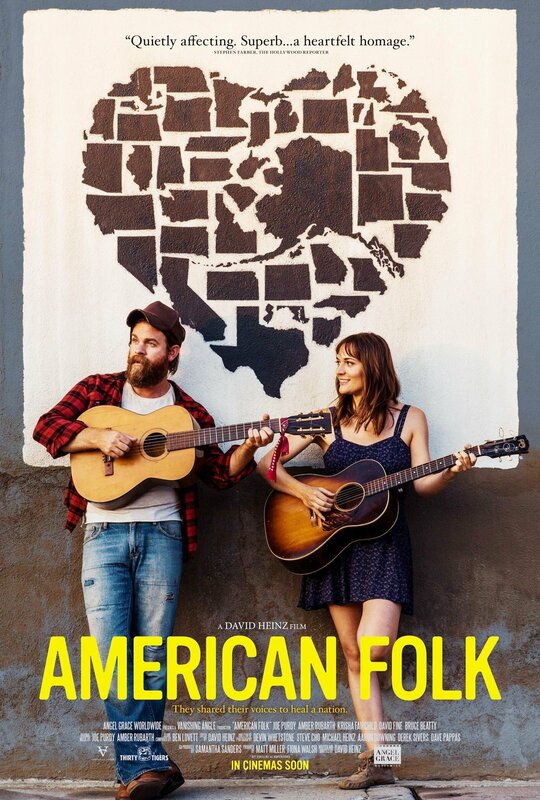 Regardless, American Folk gets by on being less about 9/11 itself and more of about these two people, finding one another, connecting through music, and also realizing the world around them is a much nicer, more compassionate place when it has to be. Writer/director/editor/producer David Heinz doesn’t have anything really ground-breaking to say here other than, “9/11 brought out the best in people from all colors, all shapes, all sizes, and all walks of life,” but hey, it still kind of works. Given the cruel, sometimes disturbingly awful world we live in now, it’s actually nice to get a brief, heartfelt snapshot of when time’s were sweeter and all around kinder, even despite the terrible circumstances that brought all of the love out of everyone. And even as a small, constrained character-study of these two people, well, American Folk could have used some help. Heinz too often makes the mistake of just having the music speak for these characters, but not really give them anything heart-wrenching to vocalize about, or even that much of a personality, despite that they’re both folksy and both kind of charming. In their feature-debuts, Rubarth and Purdy are fine, but there’s not much to these characters and you start to feel like Heinz is just trying to make this the next Once, but on the road and with a lot of sideshow characters. Wake up, Elliot. It’s 9/11. All it takes is a lot of folk music. Like, a lot, a lot. Consensus: Pleasant and sweet enough as it is, American Folk is a different kind of 9/11 movie that warms the heart and spirit, by reminding us that we can all go back to these lovely with one another. Even if it may be a pipe-dream.